We are member of the Central Florida Orchid Society (CFOS). Via e-mail if you would like information about the events that will be happening please let us know your e-mail and we will send it out if we do not post it here. 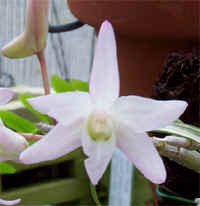 We encourage you to find out about your local Orchid Society and join and then Discover Orchids. You will find this the very best way to learn about the plants that you have (or will have) learned to love! 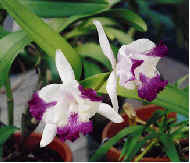 To find a local Orchid Society try the index page of the American Orchid Society. Currently the above plant has out done it’s self. It began to bloom in June of 1999 and it had 9 blooms at one time. It is still in bloom in September! We have many of them available right now. See our sales page. A very nice flower with very long spurs! The spur was about 8 to 10 inches!